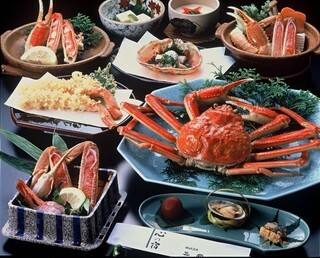 Kani Kaiseki (Full course crab set menu). Includes a free pass to the seven public onsen & Free rental Yukata. 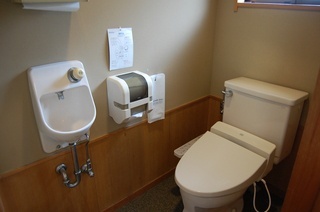 We are a medium sized Japanese inn compared to the other inns in Kinosaki. We strive every day to provide the best of services so that we may stand out and above the rest. We have 3 reservable private baths, free of course. Dinner is served in the guest's rooms, letting them enjoy the meal in private and at their own pace. How we help our guests melt away their fatigue and worries. 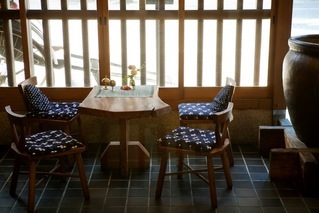 Our inn is equipped with a beauty spa offering different esthetics, like massages staring at JPY4,000 for 40 minutes. Every room has its own DVD player so that you can bring and watch your favorite DVDs(*plays only region 2 DVDs). We also have DVDs available at the front desk. We also lend child sized yukatas(cotton kimonos) and jimbei(for boys). All ingredients in our dishes are grown locally, making for even more delicious meals. Children 0~1yrs old who require nothing can stay free. *For children need meals and/or bedding please register them under the children's option on the reservation home page. *We are not equipped to provide meals for small infants (still breast feeding or unable to eat solid foods). Parents are welcome to bring any necessary food for their children. We can provide you with hot water, microwaves or anything else needed, please let us know. Service fees and consumption taxes are included in your total. Cancellation fees: 1~3 days before(20%), day of at least 15 hours before(50%), Cancellations less than 15 hours before or are no show(100%). *Groups of 15 or more cancellation fees: 14 days before(10%), 7 days before(20%), day before(50%), day of (70%), less than 15 hours before or no show(100%). ***Please notify us immediately of any cancellations or changes in the number of people.